Delighted to welcome Lynn Brittney to the blog today. A Death in Chelsea is out now in the usual formats. Published by Mirror Books. Set against the backdrop of WW1, Mayfair 100 is the telephone number for a small, specially-formed crime fighting team based in a house in Mayfair. A call comes through to Mayfair 100, where the intrepid team of investigators eagerly await their next case. A society gossip queen has been found hanged in her room in mysterious circumstances. Her enemies are numerous – and her family are convinced she was murdered. Can the group uncover the truth? Lynn Brittney has been a writer for almost 30 years. 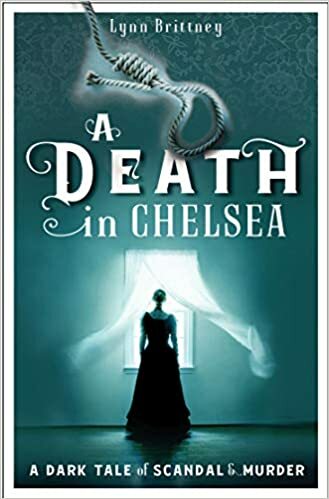 A DEATH IN CHELSEA is set in 1915 (the second year of WW1) and is the second crime-solving adventure for the Mayfair 100 team (it’s their phone number at their Mayfair HQ) – a secret team set up by Chief Inspector Beech, using the talents of skilled women as detectives, at a time when women were not allowed to join the police force. The team is also supplemented by two serving male police officers, who are needed for any dangerous work or to make formal arrests. This time the team investigate the ‘suicide’ of a titled lady who wrote scurrilous gossip about the aristocracy in a daily newspaper. It is, of course, murder and there is no shortage of suspects as the lady in question had a very long list of enemies. Who would your book be perfect for? A DEATH IN CHELSEA would be perfect for any lovers of ‘cozy crime’ (although I have been told that some of my writing is a little graphic to be classed as true ‘cozy’ crime. It would also appeal to anyone who is interested in social history and, in particular, the changing role of women during WW1, when women were needed to undertake all sorts of jobs while the men were at war. I also like to think that it would appeal to anyone who likes a good yarn, with lively characters, who love working as a team to solve these unusual crimes. Did you have a favourite character to write? I’m particularly fond of PC Billy Rigsby, who is the women’s unofficial bodyguard, if you like. A six-foot, two inch, former guardsman and army boxing champion, he loves his mum and auntie and is very protective of all the women. He is attractive, with a normally cheerful disposition and is generally loved by all women, who find him appealing. He was invalided out of WW1 with several minor but life-changing injuries and is new to the police force. It is through Billy Rigsby’s eyes that we get a lot of the police procedural and crime explained because he is so curious. He has a highly developed sense of right and wrong, so he can lose his temper with a villain or with injustice. What inspired you to the write the book? I always have a lot of ideas percolating in my head at anyone time! But this one had been brewing for quite a while. I was interested in the fact that everyone knows a lot about the actual war scenario of WW1, but very little about the Home Front of that period. Society changed rapidly, from women agitating, sometimes violently, for the vote, to all that being pushed to one side as they all scrambled to ‘do their bit’ in the war. Society had to get used to women working in all sorts of industries and offices where women had never been allowed to set foot before. Women also took over some of the crime in the big cities – running the ‘businesses’ as it were, for their men, who were conscripted later in the war. There were volunteer women’s police forces – one run by former suffragettes and one run by women’s trade union activists – but they were only allowed to do organisational things, like security amongst women workers in factories and ‘morality’ policing to try and dissuade young women from amateur prostitution in the big cities. Can you share with us a photo from 2018 that meant something special to you? This is a photograph of my son who is an actor, Tom Brittney, who took over from James Norton in 2018 as the crime-solving vicar in the tv series Grantchester. It was so strange that as I was becoming a crime writer, he was moving into the television world of crime as the amateur detective, Will Davenport. It seemed as though we were existing in tandem! What has been your proudest bookish moment? I suppose when my first novel, Nathan Fox: Dangerous Times, (an Elizabethan spy thriller for young adults) was nominated for several prizes in 2007/8, such as the Waterstones Book Prize, The Brandford Boase Award, and others. It was also put on the Department of Education list of Recommended Reading for Boys. My personal favourite of all the accolades was that it was praised by the Association of Renaissance Martial Arts for all the weaponry and fight detail being ‘incredibly accurate’. Those guys take their weaponry very seriously indeed and the book began to be read by adult males as well as young adults. Do you have any questions for your readers? I would like to know if my readers like learning new things about the WW1 period through my books. I have had a lot of social media messages saying things like “Who knew that drugs were so easy to buy in 1915?” or “I didn’t know that London was bombed by Zeppelins in WW1!”. I love it when the books inform as well as entertain. What is your favourite read of your whole life and why? I have to say that I am, personally, not a great reader of fiction. I love doing research for my books and plays and I read a lot of non-fiction but, having said that, one book that has stayed on my shelves and in my mind all my life is All Quiet on the Western Front by Erich Maria Remarque. It is a harrowing book, written by a German veteran of WW1, and shows that all soldiers, whatever side they were on in that war, experienced the same terrible stress and danger and never were able to adjust to normal life again, once they got home. Actually, I am working on a play about the changes in society after WW2, when the Government, planners and architects in Britain, took it upon themselves to tear down all the terraced houses of the working classes and fling up great concrete tower blocks, which changed society (and particularly the lives of women) forever. It fractured families and condemned some women to great loneliness and despair. It sounds a cheerless subject, but I am trying to infuse it with a great deal of dark working class humour. Then I shall start laying the groundwork for another Mayfair 100 book. Thank you Lynn Brittney for stopping by the blog today.